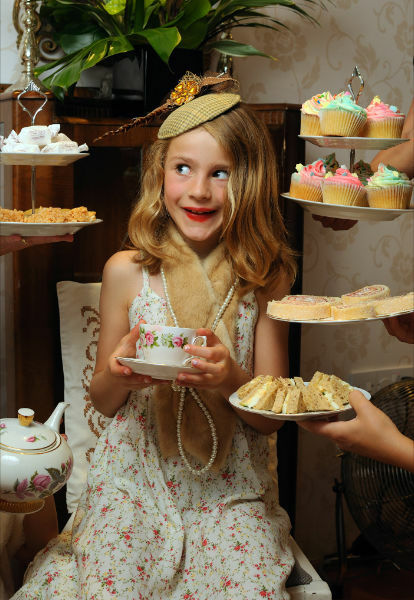 Offering dressing up accessories from the 1920s and 30s , afternoon tea with cakes and a great deal of pink and flowers, Betty Blythe is a popular choice for little girls who love to dress up and take part in a grown up Tea Party. Guests will arrive and make their way downstairs to the tea room where they will be greeted by the party host, a selection of workshops are available before heading downstairs for tea. 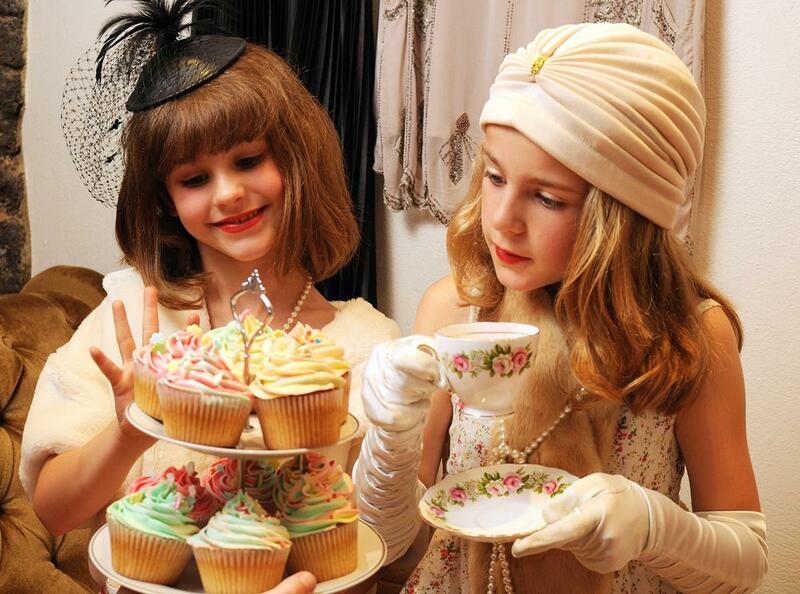 Accompanying every child’s tea party is the wonderful opportunity for exploration into another era. The party guests can adorn themselves in pearls, gloves and fascinators and many other fashion treasures which can be worn to tea - not before a movie photo shoot on 'the Moon' prop where the group of new found starlets can practice their vintage Hollywood poses. The tables are set for tea! There will be teapots with hot chocolate, to be drunk from pretty cups. The guests are invited to the table and given a delicate introduction to etiquette of Afternoon Tea and conversation, grace and decorum. Napkins, plates and flowers adorn the table. Mini sandwiches will be served on stands - a selection of cheese, ham, jam and cucumber. There will be a tempting array of pink wafer biscuits, popcorn and mini muffins. Tea will finish with mini cupcakes or you may wish to upgrade to large fairy or chocolate cupcakes or a birthday cake made to your requirements. 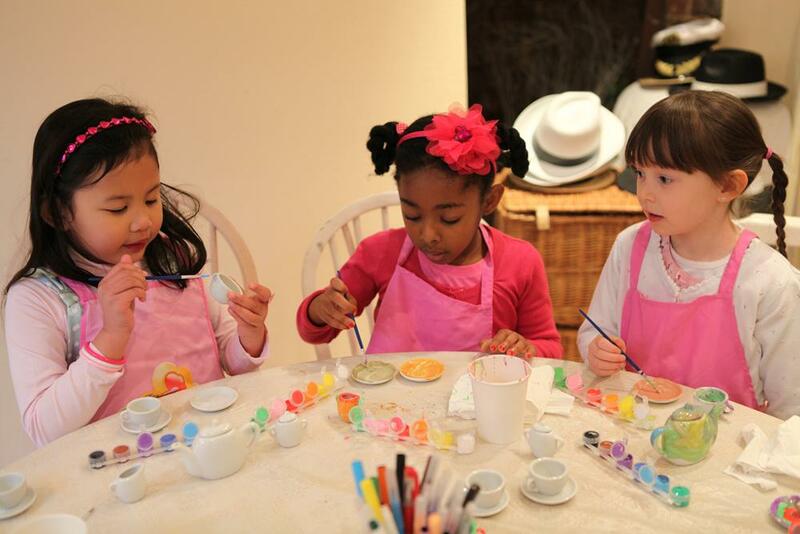 These activities can be purchased additionally to the one hour tea party and last approximately an hour, usually prior to the tea party.Prices indicated are for a group of eight or less. If you wish to provide your own activity there is a room hire fee of £100. Budding biscuiteers - Popular for all ages we provide a selection of homemade vanilla biscuits for the children to decoratewith different coloured icing and lots of different sprinkles. Shapes include sophisticated handbags, lipsticks and shoes! Presented in a previously decorated box by the children to ensure they make it home in one piece! For dazzling jewellery designers, this activity is tailored to the skills and abilities of the group and usually includes a stylised bracelet and a choice from a selection of beads where the group is encouraged to think about design and pattern of their creations. All creations are presented in take home bags. Further jewellery crafts are available upon request. What would it be like to be a chocolatier? In this activity we take a look at the wonderful world of chocolate and all its many possibilities. Looking at chocolate within the pantry shelves the group design the packaging for their brand of chocolates. Then on to the delicious bit! Melted chocolate with a large selection of moulds to choose from we teach different techniques from layering and marbling, adding sprinkles and glitter for a professional looking box of chocolates to take home, if not eaten before leaving the shop! During this creative activity the children are encouraged to explore the designs of the vintage teacups used in the tea party for inspiration.Then paint a full children’s sized tea set with their chosen colours and patterns. The paints are then air dried, and are presented in a take home box which the children get to decorate in their chosen style. We provide aprons but warn that the paint does like to stain clothes. Parking is available on the street Weekday £2.20 per hour and free at weekends. Parents are welcome to stay upstairs (if available) to relax; food and drink can be purchased separately. Please email tea@bettyblythe.co.uk to enquire about availability and to confirm, as we cannot take bookings or enquiries on the telephone line due to consistent customers and parties in the tea room. Due to high volumes of enquiries please allow three days for us to respond with availability. If you wish to hold the party in your home or venue of your choice, check out our film themed menus. Minimum of ten children. Prices don't include delivery, service or crockery.